Shirley Chisholm, the trailblazing New York congresswoman who was the first black woman elected to the U.S. House of Representatives and the first black candidate on a major party’s presidential ticket, once said, “If they don’t give you a seat at the table, bring a folding chair.” The phrase served as a mantra and rallying cry for Cincinnati’s Tamaya Dennard in her campaign for City Council last year. It was her first bid for public office, and Dennard won. On Tuesday, she and the rest of the nine-member council took their oath of office. Dennard, in Chisholm-esque “unbought and unbossed” fashion, came with her own folding chair. Photographed at her swearing-in with a candy-apple-red chair in her hand (no gunmetal gray here), Dennard made clear what changes she would like to see in Cincinnati. As WLWT-TV reports, Dennard addressed poverty, a problem that, while improving, has plagued the city for generations. 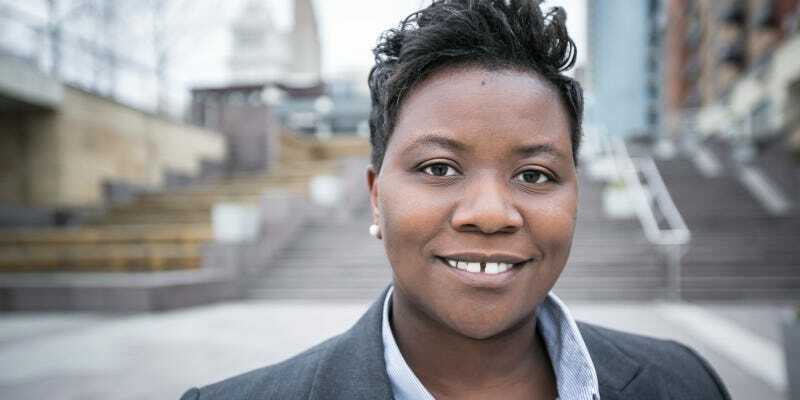 WVXU reports that Dennard was also sworn in as the City Council president pro tempore, which would allow her to serve in the mayor’s role on the council if the mayor and vice mayor were not available. Read more at WLWT-TV and WVXU Cincinnati.